Surely someone who has celebrated numerous birthdays understands how important these occasions are. The excitement however, of a child celebrating his/her birth day is undoubtedly incomparable to that of an adult most especially if it’s the child’s 1st birthday. Anxious parents would be preoccupied blocking venues, looking for the perfect attire and choose the right mix of dishes for food. Equally important however would be the medium of how details of the momentous event would be cascaded to each prospected attendee; the INVITATION. In any social gathering, the invitation would dictate the details of the event, the dress code and other important information needed for the party. Before people usually get to the inner part however, the façade would be most noticed. Therefore, every inch of the invitation is carefully examined, scrutinized and criticized (not to your face though) and would dictate the general impression of the event. Thus, grand preparations would be futile if your invitations would represent mediocrity. With the help of these tips therefore, make your invitation scan worthy enough for the guest to scan through the contents and have no hesitation in going to this well prepared event. A good birthday invitation conveys the celebration of thanksgiving for the previous year, and a culmination of looking forward to another year. Symbolic visuals and heartfelt happy birthday wishes complement the overall look to add life to the plain announcement of date, attire and place. Take these wordings for example that depict the excitement felt by the celebrant’s parents and friends. 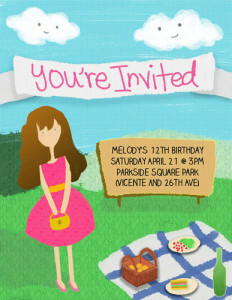 Notice how the words rhyme to embellish the invite with an artistic touch. If you think that these poetic lines are too informal, then you can check these headings which depict more formality. for the 1st birthday of our boy Sean. not only for children but to the adults as well. Attached is the map for directions to the venue. Join us in welcoming our son into his teenage years. Be in your beach attire and get ready to get wet! Again tailor-fitting your heading to the celebrant is of utmost importance. A more formal party may require a more formal tone as far as the wordings are concerned. 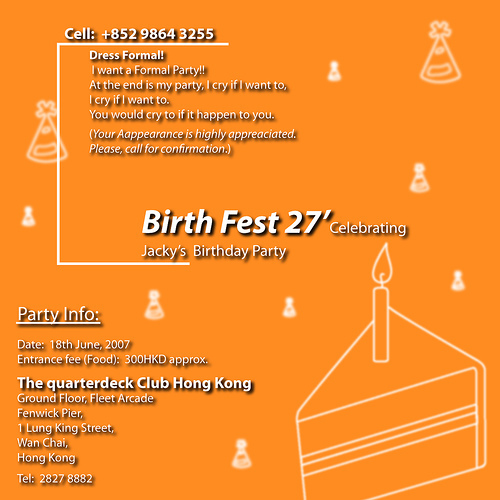 You can also adjust your birthday invitation wordings based on the party’s theme such as using words related to summer or water for an invite to a beach party. It’s not about how flamboyant or attractive the wordings used are. It’s using the appropriate tone for the appropriate occasion. All in all, birthday invitations are balanced. They are both informative and attractive. Those who plan on producing these should always remember that the invites have to entice first then inform the guest of the event. Express your creative side in decorating the façade to make the invites more personalized. Take in to consideration however the length of time required for the distribution of the invites whether it be given personally or through mail. 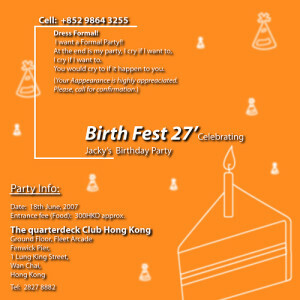 Having a substantial and attractive birthday invitation would both inform the guests about the event and at the same time leave them hanging and excited to attend the party.